The “hottest mess in history” that we’ve all been waiting for has officially arrived in the form of Katy Perry’s “Swish Swish” video. As we already learned from Perry’s “Swish Swish” trailer, the highly anticipated basketball-themed video features cameos from the most awesome (albeit random) assortment of celebs, including the cast of Netflix documentary series GLOW, the kids from Stranger Things, SNL alum Molly Shannon, and obviously, Nicki Minaj. 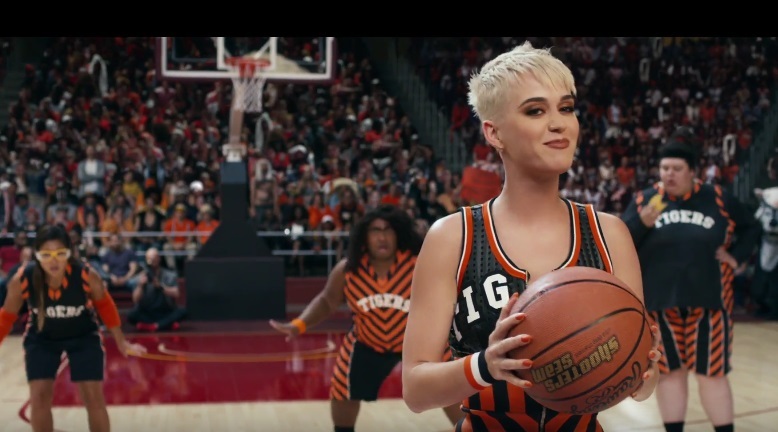 The Dave Meyers-directed “Swish Swish” visuals open with Perry sitting atop a pyramid of basketballs and falling, which gives you a huge clue of the oddball hilarity to come. So, this is yet another one of Perry’s videos that needs to be viewed multiple times because there’s just so much happening that it’s hard to take it all in at once. For instance, there’s a blonde-wig wearing Terry Crews raging on the sidelines as the coach for “The Sheep,” a team member who literally eats a basketball mid-play (yes, really), dancing refs wearing shades and gold chains over their uniforms and an audience that prefers voguing over doing the wave. Then Minaj comes through with the halftime show and transforms the scene from over-the-top goofy to fiery and seductive. She slays her rap/singing feature like a total badass and then hits the sideline to give Perry a brief pep talk that inspires her to get her stuff together. OMG, that was wayy tew much y’all. BRB, we’re about to dive back into the madness and watch until we commit every fantastically quirky moment to memory.